Organised around three key areas, Future Imperfect draws attention to the ongoing demands and antagonisms that have affected cultural production across the region, both in historical and more recent post-revolutionary contexts. In doing so, it offers an in-depth discussion of how cultural producers have developed alternative institutional models to negotiate the constraints placed upon their practices. How cultural institutions operate within the conditions of a global cultural economy, and alongside the often conflicting demands they place on cultural production in the region, is likewise an over-arching point of reference throughout this volume. 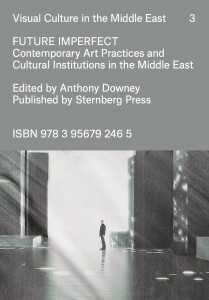 While the politics of contemporary cultural production and institutional practices in the Middle East can tell us a great deal about local and regional concerns, one of the cornerstone ambitions of this volume is to enquire into what they can also impart about the politics of global cultural production. This involves exploring the multiple ways in which contemporary art practices are being reduced, willingly or otherwise, to the logic of global capital. What, in sum, is needed in terms of infrastructure for cultural production today, and how, crucially, can we speculatively propose new infrastructures and institutions in the context of present-day realities? The publication is accompanied by a collection of special projects on the Ibraaz website from Leila Al-Shami, Wided Rihana Khadraoui, Lois Stonock, Nile Sunset Annex, Alia Rayyan and Husam Al-Sarray.